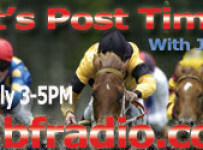 Thursday, July 30 –Gulfstream Park will have nine races today with a first post time of 1:15 p.m. There are no stakes races. The featured seventh race is a $75,000 optional claimer at one mile on turf for 3-year-old fillies. The purse is $44,000. Miss Margaret and Little Bit Lovely are likely favorites in the nine-horse field. Miss Margaret’s record includes a second place finish and a third place finish in one mile turf stakes at Gulfstream this year. Jesus Rios will ride for trainer Milt Wolfson. Little Bit Lovely is coming off a gate-to-wire win, by 5 3/4 lengths, in a $50,000 claimer at one mile on Gulfstream’s turf on June 26. She won in a nine-horse field that included older horses. Past performances indicate that Little Bit Lovely could be the controlling speed again today. Tyler Gaffalione has the return ride for trainer Ralph Nicks. The field also has Afleet Mary and Susie Bee, who have both hit the board in one mile turf claiming races at Gulfstream this year. * There is a $65,979 carryover on the Rainbow 6 on today’s last six races. The sequence is on the fourth through ninth races, starting on the fourth with scheduled post of 2:54 p.m.
* On Saturday, Gulfstream will have the $75,000 Trinniberg Stakes at seven furlongs on dirt for 3yrsr-olds and up. 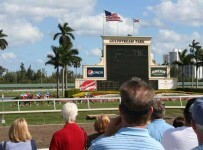 The seven-horse includes multiple Gulfstream sprint stakes winners Grande Shores and City of Weston. We will have a preview on Saturday morning.